Meet Ksyusha, the Houdini cat. This Himalayan kitty loves nothing more than to squeeze herself into tight places. Her owner, Yuriy, first discovered her pet’s penchant for escape artistry when she found Ksyusha had lodged herself into an empty pickle jar. She’s also a fan of the dryer, as you can see below. Admittedly, this cat is hardly gay blockbuster news. I just couldn’t resist. She’s a Houdini cat, hello! I've got to meet this cat. 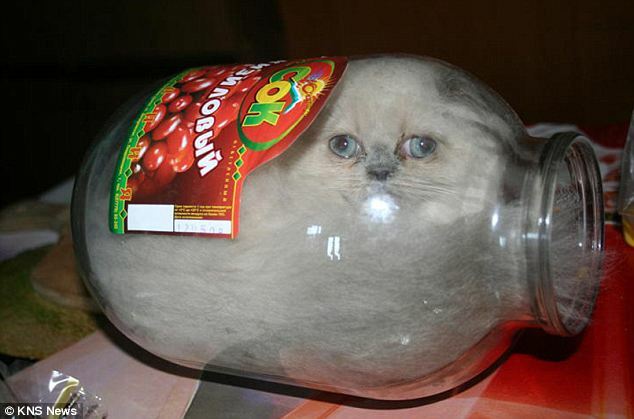 Have you ever seen a cat in a pickle jar before?